Tuesday 10th October 2017 in Florence the seminar “Beyond the Forteto horrors” will be carried out in the Brunelleschi hall of the Istituto degli Innocenti. The themes treated will be about the Forteto event and the experience of the Oltre project working on the support of victims. The discussion will be also about the responsibility of the public institutions, policies on victims’ support, compensation and prevention. The seminar will be attended, among others, by Stefano Mugnai president of the first Regional Inquiry Commission about Forteto, professor Ketherine O’Donnel member of Justice for Magdalenes Research, the magistrate Vittorio Borraccetti and the neuropsychiatrist Marinella Malacrea, in addition to the representatives of the institutions promoting the event. Tuscany Region, Artemisia Association, Società della Salute Mugello, Formazione Co&So, Abitare Solidare, Association of Tuscany’s Municipalities. 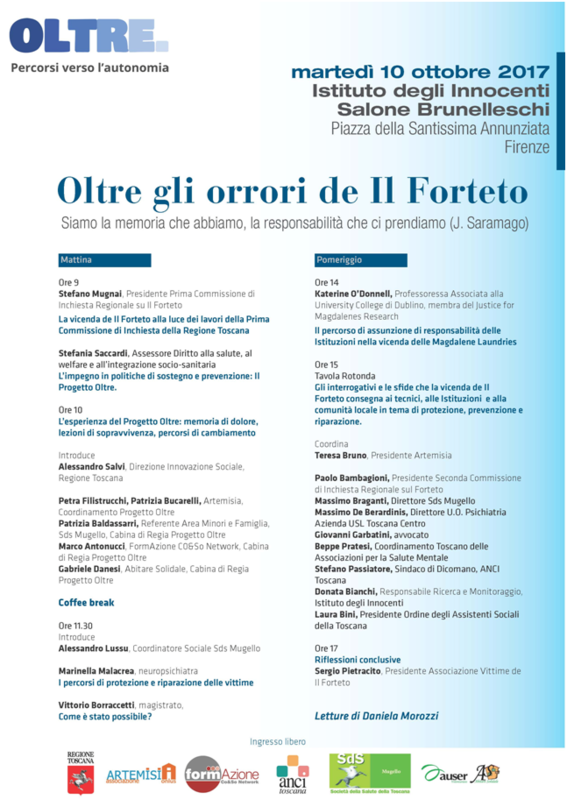 The Association of Forteto’s Victims will expose the conclusive reflections of the event.